A total of 20 Bay Area Bike Share stations will be installed in downtown Redwood City, Palo Alto, and Mountain View. Click for an interactive system-wide map. All the way down the Peninsula, excitement around the pilot launch of Bay Area Bike Share comes tempered with a dose of concern about the small number of bikes that will be clustered around Caltrain stations in five cities. Bay Area Bike Share’s meager scale at the time it launches is sure to limit its usefulness. Half of the system’s 70 stations — holding ten bikes each — will be placed in downtown San Francisco, and the other half distributed among participating cities down to San Jose, which will get 15 stations. Redwood City will get just seven stations, Palo Alto six, and Mountain View seven. Nonetheless, advocates say the launch of bike-share is overdue. Hundreds have already signed up for Bay Area Bike Share since membership sales opened on Monday. For $88 per year, members can rent sturdy new celeste-colored city bikes for up to 30 minutes at a time for free, with surcharges for trips longer than that. The system is set to arrive at a time when both transit and bicycle commuting are surging. 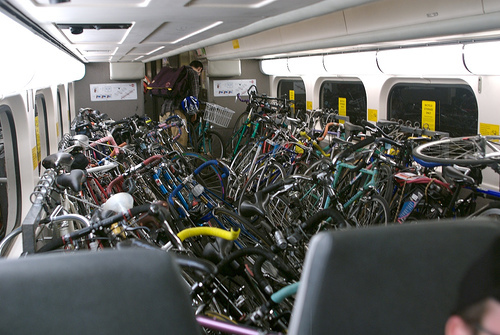 Caltrain ridership has increased 80 percent over the past decade, and the number of commuters bringing bikes on board has tripled, according to the agency’s stats. With commuters who are able to use the shared bikes instead of hauling their own bikes aboard, bike-share could free up some much-needed bike storage space on the train. This is a big part of bike-share’s promise — that it will provide a convenient solution to the “first- and last-mile problem” for people connecting to transit on the Peninsula. Because of its narrow geography, most commuters live or work within three miles of a Caltrain station or a bus stop along El Camino Real. But low-density, suburban sprawl development patterns mean far fewer people live or work within a typical walking distance of half a mile or less. The pilot launch will only cover a limited area within each city, and residents are expected to clamor for a rapid expansion of bike-share once they get a taste, said Heyne. The initial 700-bike system should be expanded to 1,000 bikes in early 2014, according to the Bay Area Air Quality Management District, which oversees the program. But further expansion depends on funding that local agencies have yet to identify. Unlike some other American bike-share programs — like New York City’s recently-launched Citi Bike, the nation’s largest system — Bay Area Bike Share currently has no corporate sponsor to help defray capital and maintenance costs, though BAAQMD says it’s looking for one. But one Peninsula city is getting a head start in hopes of joining in. San Mateo recently commissioned a feasibility study from Alta Planning + Design to show that the city’s demographic and commuting characteristics would support bike-share. Alta is also the vendor of Bay Area Bike Share and a number of other major bike-share systems in the United States. Kenneth Chin, project manager for the San Mateo Public Works Department, said the agency is partnering with the San Mateo Health System to fund a three-station pilot within the city at the Hillsdale Caltrain station and two medical campuses. The Health System has already committed to fund two-thirds of the pilot program’s cost, and the San Mateo City Council is expected to consider funding the remainder in October. Alta and BAAQMD need to take a concessionaire approach to BABS expansion. That way BAAQMD and Alta don’t need to be out in front but rather can roll out large expansions where cities pay for it. It’s an approach that’s working well in the DC area, with each jurisdiction’s DOT funding or pushing for expansions of the system within their own borders. So if Marin decides to buy into bike share, San Francisco expands to the whole city, and San Mateo finds a sponsor for their own little system, Alta and BAAQMD treats those as separate clients and works with each individually on station placement and infrastructure improvements. Without this, it could easily get too ungainly for BAAQMD or Alta to effectively manage as a singular system. Come on Google, Apple, Facebook, Twitter, EBay, Yahoo, Adobe, Intuit, Intel, etc. We know that your employees love to catch Caltrain. How about sponsoring the bike share system so that it can expand to a useful level. For a paltry amount of money to any of these companies, we could have a system on par with New York’s (ie 10 times as large). To the best of my understanding, the Bay Area Air Quality Management District isn’t even asking employers to fund stations until they get one big overall sponsor like Citibike. I suspect employers and developers are very eager to have a bike share station which is a great perk and saves them expensive car parking. But they don’t have anything to buy yet. Our local employers are some of the richest (in terms of market cap) companies in the country and are run by some of the richest (in terms of billions of dollars in the bank) people in the country. No reason why one of them can’t use their pocket change to become the big overall sponsor of the system. Word. Who needs a big sponsor. Get the employers to fund a station on their campus. Pennies. How much does Intel contribute annually for a Caltrain shuttle? Not exactly pennies – a good sized station runs $50k. But yes, pocket change for google and facebook. It’s sickening how NYC whored out their bike sharing program to a bank yet still expect the public to PAY for the privilege of polishing the banking’s reputation. The moment they sell the naming rights of our bike program to a corporation, I’m quitting. I will delete every post I’ve ever made supporting Bay Area Bike Share and begin loudly spreading lies and encourage everyone to vandalize both ad covered bikes and especially the sponsor. $50k? Then I amend my statement. I figured it would cost more and those companies would be out pennies. At $50k, then they are printing money. I know many companies spending ridiculous amounts of money on traffic mitigation and parking. Facebook is the primary example, they have kicked in some major coin for infrastructure around the new Menlo Park Campus. The more cyclists, the smaller their TDM problem. Other big example is almost certainly Apple and how much they are putting into traffic and parking issues for the new spaceship campus (but Apple actually is a long way from Caltrain – 7ish miles, unlike Facebook and especially Google). I can’t quite decide if I believe the NYC bikeshare sponsorship ended up being a net positive for Citibank. On the flip side, I think CitiBank (and Barclays in London) has helped give a bad name to NYC bikeshare. Whether that’s worth being able to launch on such a large scale, well probably, but I like not having a corporate sponsor for Bay Area Bikeshare. It’d be nicer if they could just pool smaller amounts of money like a tech-company-fund-for-a-greener-bay or something cheesy like that rather than one big million dollar donation from one company. Barcelona was able to launch an extensive Bike Share system without destroying their streetscape just so a bank could charge the public for the privilege of being turned into rolling ads to rehabilitate a corporation public image. Spain also built a high speed rail system. Until you can figure out how to get our populace to raise more taxes, we’re stuck with corporate handouts or no nice things. Yep, we’re getting exactly what we deserve. Which is why I have absolutely no problem at all with vandalizing public infrastructure that’s already been sold to the highest bidder. If fact, Muni’s bus “shelters” are fully maintained by a private corporation in exchange for putting ads on them. Vandalizing shelters does not incur any costs to the SFMTA or the City so doing damage to them only cuts into corporate profits being made off of us. Tagging, shattering the glass, etc. should really be viewed as a public service and the vandals celebrated as heroes for reclaiming a piece of the public realm. doing damage to them only cuts into corporate profits being made off of us. And one of the reasons that they “love to catch Caltrain” is because at least some make it free for their employees. Both employer and employee are punished for taking away public open space to for private gain without any benefit to public whatsoever. We get streets free from advertising, some duchebag looses his job for having ruined it in the first place, and the City can stop wasting money finding ways to sell us out and will have incentive to put up signage and maps at Muni stops that don’t turn the ad company a profit. BAAQMD management seems to be holding back the project with such a paltry launch and uncertain implementation schedule. It’s just going to piss people off when they’re paying for something that provides an insufficient amount of bikes and stations. We need BAAQMD to step back and give a stronger management presence of Alta Bike Share to sign on a corporate sponsor and dramatically expand the service. 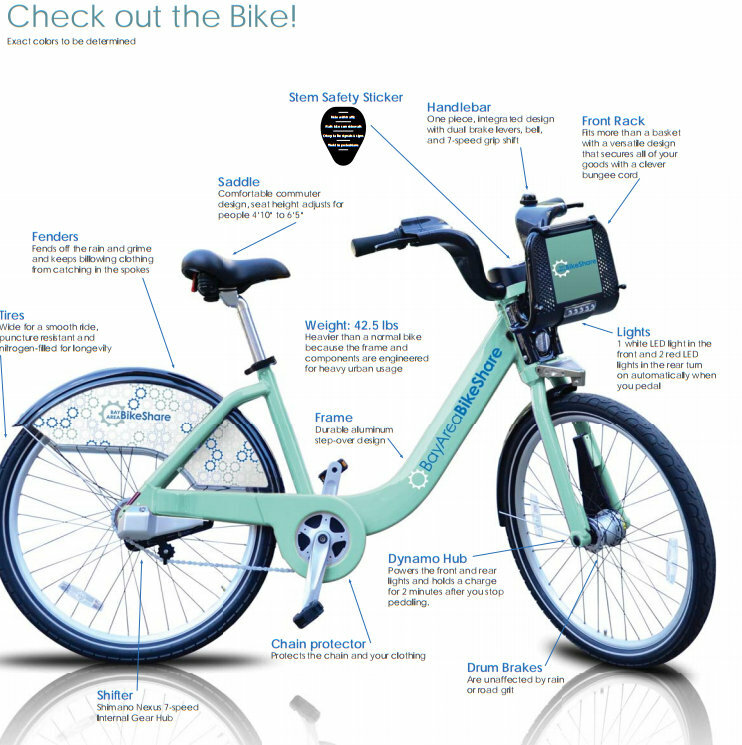 The City of San Mateo will double its Bay Bikes bike share fleet to 100 bikes by October.